Ravenna passenger and car ferry ticket prices, timetables, ticket reservations and information for ferries sailing from Ravenna to Porec. Compare all available Ravenna ferry ticket prices in real time and book the cheapest available Ravenna car and passenger ferry tickets sailing to and from Ravenna, Porec with Venezia Ferry Lines ferries online with instant confirmation. Book Ravenna Ferry Tickets with Venezia Ferry Lines for ferries sailing from Ravenna to Porec online in advance to enjoy the cheapest available ferry ticket price. The price you see is the price you pay. There are no hidden extras or surprises such as added fuel surcharges or booking fees and we do not charge you anything extra for paying with a Visa Electron card. The price we quote you for your selected Ravenna passenger or car ferry ticket, onboard accommodation and vehicle type is all you will pay, and that's a promise. To obtain a Ravenna ferry ticket price and book your ferry ticket securely online please use the real time ferry booking form on the left. You are also able to add a hotel at your destination, or anywhere else, to your ferry ticket when completing your ferry ticket reservation. Ravenna is an elegant town in the Emilia-Romagna region of Italy; not far from the Adriatic coast. It is most famous for its fabulous early Christian and Byzantine mosaics, which date back to the time when Ravenna was the capital of the Western Empire, then under Ostrogoth and Byzantine rule. The town's greatest mosaics have been given UNESCO World Heritage status. Ravenna is a pleasant place to wander and to spend a night or two. It is not one of Italy's most obvious tourist destinations, and appeals mostly to those who have specialised interests or want to know the country in greater depth. This means that the streets are not over-crowded with tourists or souvenir stalls, and there is a real 'local' feel as residents bump around the town's lanes on their bicycles, greeting friends and collecting the shopping. However, the main attractions do seem to be on quite a few tour groups' itineraries. When I was there, the groups - mostly Italians and schoolparties - seemed to arrive and leave by coach so they didn't flood the town. But it meant that within the main churches and in their immediate vicinity there were sometimes uncomfortable crowds. The best thing to do is to try to avoid them, perhaps picking times to visit first thing in the morning, in the later afternoon, or while they are all at lunch. I found that the groups were only visiting one or two of the biggest sites, so the smaller attractions were much quieter and sometimes I was the only visitor. The heart of Ravenna, and the best place to get your bearings, is Piazza del Popolo, which can be reached in ten minutes from the railway station by walking straight ahead along Viale Farini and then Via Diaz. This charming piazza is lined with attractive historic buildings including the Palazzo Comunale (Town Hall), originally built in the fifteenth century. As they did elsewhere, the Venetians erected two columns in the square during their rule; instead of Venetian emblems these are topped with statues of Ravenna's patron saints San Vitale (St. Vitalis) and Sant'Apollinare (St. Apollonaris). There are cafes with outdoor tables, and it's a lovely place to sit and relax. The most important tourist attractions in Ravenna are the mosaics, and the churches housing them, which are on UNESCO's World Heritage listing. Best Price Guarantee - We always offer you our lowest available Venezia Ferry Lines passenger and car ferries ticket price to and from Ravenna. There are no hidden extras or surprises such as added fuel surcharges or booking fees and we also we do not charge you anything extra for paying with a Visa Electron card. The price we quote for your selected Ravenna ferry ticket, onboard accommodation and vehicle type is all you will pay, and that's a promise! In the unlikely event you find the same all inclusive Ravenna ferry ticket cheaper in the brochure of any other tour operator we promise that we will do our best to beat that price or offer you the choice of requesting a refund. 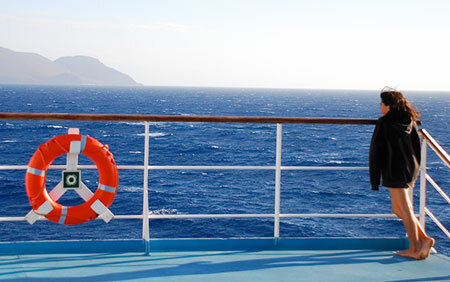 To book Ravenna car and passenger ferry tickets please click here. At ferryto.co.uk you are able to obtain live Ravenna ferry ticket prices, check availability and book car and passenger ferry tickets to and from Ravenna at our lowest available ticket price. Ferryto.co.uk is part of the world's largest online ferry ticket distribution network providing the ability to book over 80 major European ferry operators including to Ravenna and to over 1,200 other ferry routes throughout the UK, France, Spain, Ireland, Holland, Eastern Europe, the Mediterranean, the Baltic and North Africa.